Pasteurisation and sterilisation are now well established as a key step in the production of many different food and drink products. Both pasteurisation and sterilisation involve the use of heat, usually in a way which does not affect the fundamental characteristics of the product (in other words, it doesn’t cook it). However, while sterilisation seeks to completely eliminate any micro-organisms which may be present in the product, pasteurisation reduces the microbial load by a significant factor, which in normal circumstances reduces them to a level at which they do not pose a hazard. In order to meet the diverse range of requirements for these processes, HRS Heat Exchangers has created its Thermblock packaged pasteuriser/steriliser for food products for aseptic filling. All Thermblock systems allow for full adjustment and can be used as HTST (High Temperature, Short Time) units, to minimise potential side-effects, such as organoleptic changes or nutritional losses. Suitable for applications such as: diced tomatoes, onions, and fruits; as well as products with large particles, such as soups and sauces, baby food, jams and marmalades. 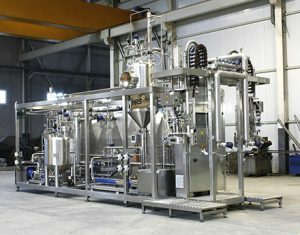 This features a double tube pasteuriser and steriliser for food products containing pieces or particulates, such as fruit and vegetable dices. The steriliser comprises double tube corrugated heat exchangers from the HRS DTA Series and also includes a positive displacement HRS BP Series piston pump which is specifically designed for products containing large pieces. Suitable for products with high viscosity, including: tomato pulp and paste, ketchup and pizza sauce, fruit puree and concentrate, jams and marmalades etc. The Thermblock AS is composed of concentric tube heat exchangers, or annular space heat exchangers from the HRS AS Series, with product flowing in the central annular space, while the heating or cooling media passes through both the internal and external jacket. The steriliser can also include a high pressure piston volumetric pump suitable for high viscosity products. For lower pressure applications, or products with particulates, the HRS BP Series of piston pumps is recommended. Designed for food with low or medium viscosities, such as: juices and beverages, fruit and vegetable purees and concentrates, milk and dairy products, and smooth soups & sauces. The steriliser is composed of multitube corrugated tube heat exchangers from the HRS MI Series and HRS MR Series. It can include direct or indirect energy recovery, meaning up to 90% of the energy can be reused, greatly reducing overall energy consumption and improving the return on investment. 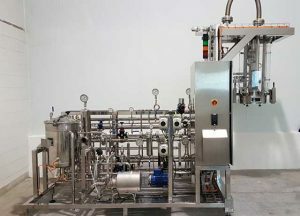 The post HRS packaged solutions for pasteurisation and sterilisation appeared first on HRS Heat Exchangers. This entry was posted in Copywriting and tagged HRS Heat Exchangers on 11 April 2019 by Richard. Waste is increasingly viewed as a resource. From well-established practices such as recycling paper and aluminium, to the development of the circular economy, an increasing volume of resources are now being recovered from materials that were previously seen only as inconvenient wastes. Waste valorisation is the process of recovering value from waste materials, for example through reusing or recycling them, or by composting or anaerobically digesting them and converting them into more useful products such as materials, chemicals, fuels or other sources of energy. In a circular economy, compared to a linear one, the materials within products are reused, turning previously burdensome wastes into valuable resources. Moving to a circular economy can have a positive effect on economic growth and strengthen the competitiveness of companies, in addition to providing a number of environmental benefits. The European Union has proposed to double its rate of resource productivity by 2030 and as part of this, adopted a communication, Towards a circular economy: a zero waste programme for Europe, in July 2014. Wastewater treatment and ‘water mining’ has been identified as a key platform on which to base the technological development of such circular production systems. In addition, every cubic metre of recycled or reused water results in a corresponding reduction in mains water demand and wastewater discharge. There are also benefits in terms of energy and carbon footprint, and waste streams are increasingly being viewed as a resource for the development of bio-based products and processes. While we are still a significant way away from the commercial development of large scale biorefineries, parts of this process are already established. The use of anaerobic digestion is now widespread, and there are various examples of material recovery from different waste streams in operation at various scales around the world. Recovery of phosphorous from sewage for use as agricultural fertilisers. The potential recovery of biopolymers from the wastewater from olive mills. Treating cheese whey wastewater to produce products for food manufacturing and pharmaceuticals. The recovery of spent yeast products for use in food production. Fruit processing is another sector that is ideally placed to capitalise on the potential value of some of its waste products. Citrus peel waste accounts for up to half the total volume of citrus fruit processed globally and is a potential source of many useful products including dietary fibre, antioxidants, food colorants and flavours, and contains a wide variety of compounds. Zero liquid discharge (ZLD) is a technique by which liquid waste streams are eliminated: any wastewater is purified and recycled, while other residues, which often include the type of valuable by-products mentioned above, are extracted. Various processes are employed in ZLD, but evaporation is a key process, both in order to concentrate residues sufficiently to allow their economic extraction or physical removal, and as part of the water purification process. However, solid-liquid mixtures are complex and it is important that the first stage of any potential project includes a research study to evaluate the nature of the waste stream/s and the saturation levels required. HRS Heat Exchangers have been involved in ZLD projects in Europe using evaporation systems, including the recovery of potassium and sodium sulphates from organic brine waste streams. For more information on how HRS Zero liquid discharge systems can be used to recover valuable resources from your waste stream, please contact us today. The post Finding value in liquid waste streams appeared first on HRS Heat Exchangers. This entry was posted in Copywriting and tagged HRS Heat Exchangers, waste on 29 January 2019 by Richard. At SMAGUA 2019 Stand E12, HRS Heat Exchangers will explain why resource and energy efficiency is just as important when dealing with wastewater streams as it is for fresh water availability. Under Article 9 of the EU Water Framework Directive (WFD), governments have a responsibility to apply the principle of recovering all costs associated with water services, including environmental and resource costs. These can be wide ranging; from managing abstraction to ensure sufficient flows in water catchments, through to ensuring that any water discharged back into the natural environment does not lead to environmental damage or degradation. HRS Heat Exchangers produces a full range of heat exchangers and other equipment for the water and environmental sectors. Whether you are looking to recover valuable heat energy from clean water streams, or need a full Zero Liquid Discharge (ZLD) system for industrial sludge, HRS has the solution. In particular, the Unicus and DTI Series of scraped surface heat exchangers are ideal for the treatment of high fouling sludge and effluents. 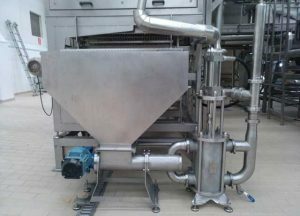 Applications include pasteurisation of sludge before discharge or further treatment; evaporation to reduce sludge and waste volumes; or cleaning water so that it can be reused. From standard heat exchangers and treatment systems, high levels of operational thermal efficiency are combined with the best materials and heat regeneration to ensure long lasting and efficient operation. It is almost nine years since the adoption of the WFD and governments across Europe are now well advanced in implementing it at a national level. As a result, it is more important than ever that everyone involved in water use, management and treatment – from industrial and agricultural users through to municipal water and sewerage organisations – is operating not only in the most economically sustainable way, but also with the lowest possible environmental impact. Now in its 45th year, SMAGUA, which is one of the leading events for the international water and irrigation industries, takes place 5-7 February 2019 at the Feria de Zaragoza in the Aragon region of Spain. This entry was posted in Copywriting and tagged HRS Heat Exchangers on 25 January 2019 by Richard. In today’s fast moving food and drink industry innovation is king. Everyone is looking for the next product to give their business the edge and food fashions and trends come and go with increasing speed. Food manufacturers often need to use seasonal ingredients, potentially offering limited edition flavours or varieties of key products: from herbal ice creams and summer berry drinks, to fruity condiments and vegetable smoothies. As a result, the life of innovative products is often shorter than has been seen previously and it can be hard for new product developers and marketers to pick which will survive in the market and which will fall away. All of these factors create challenges for operational factories and production lines. No business wants to invest in a fully-scaled line for a product that may have limited (albeit still successful) sales. The new HRS Asepticblock Mini Series allows manufacturers to produce new trial products with the minimum amount of product in a short time, reducing the unnecessary expense or wastage that can accompany full scale trials, and alleviating the need to suspend or interfere with the routine production of regular products. It allows the reproduction of a full scale final pack, but from as little as 20 to 50 kg of product. Matt Hale, International Sales & Marketing Director at HRS, explains the driver behind this concept: “The Aseptic Mini Block Series was born from the need of many of our small- and medium-sized customers to produce relatively small quantities of aseptic products, but who are prevented from doing so by high upfront capital costs and low return on investment. The HRS Asepticblock Mini Series is designed for such producers working with a range of high value products including fruit and vegetable purees, fruit based products, condiments, sauces, soups, prepared foods and many others. The design combines both the steriliser/pasteuriser and aseptic filler in one package, mounted on a single frame with a single control panel. As well as resulting in a compact and flexible unit which requires less space, the material and manufacturing costs are significantly reduced, meaning that prices for the Asepticblock Mini are up to half of those associated with conventional units. One of the first customers is a multi-national food and beverage company, specialising in the production of own-label fruit products, juices, smoothies, drinks and ice cream. “With just 20 to 50kg of product, the company can replicate their full industrial process, producing the end product in the same aseptic format as they would with the full industrial scale system,” explains HRS Heat Exchangers’ Technical Manager Francisco Hernández Ortiz. 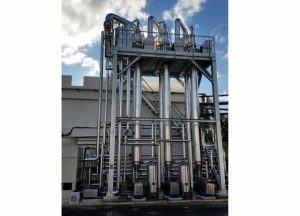 The post Assisting product development with new mini aseptic solution appeared first on HRS Heat Exchangers. This entry was posted in Copywriting and tagged aseptic filling, HRS Heat Exchangers on 20 January 2019 by Richard. Cross contamination in the pharmaceutical industry is not just an issue for those working in it, but also for the wider public as a whole. Understandably, most of the attention on contamination in pharma manufacturing and processing is focused on either cross contamination between products or agents, or from the spread of agents, such as biological cultures, within a facility. In fact, the potential harm of biological and other agents escaping from production sites has recently been highlighted by environmental pollution from antibiotics in a number of countries, which is believed to be a contributing factor to rising levels of antibiotic resistance around the world1. Furthermore, viral contamination can also be a serious threat for any type of bioprocessing laboratory or manufacturing facility2. Thanks to the increasing use of outsourced production, new technologies and continually evolving biological and microbiological techniques, ensuring safe pharma manufacturing has become increasingly complex3. Attention also needs to be given to the potential contamination of (and from) environmental factors used in the production and processing of pharmaceuticals, such as water and air used for process heating, cooling or sterilisation. Obviously, the best option is to prevent contamination in the first place and there are many regulations to enforce this. 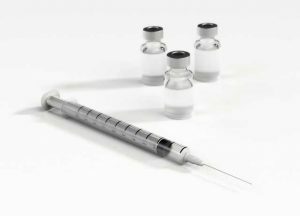 Consequently, many of today’s pharmaceutical manufacturers are reducing their contamination risk through the use of robust procedures and well-designed equipment. One such example is the new and improved HRS S Series of corrugated multitube heat exchangers. The S Series is fitted with a double tubeplate to overcome the potential issue of contamination between the product side and service side materials which is a prerequisite for some pharmaceutical applications. This design prevents contamination and provides leak detection while offering all the usual benefits of HRS Heat Exchangers’ normal corrugated tube design, including reduced fouling, improved heat transfer and reduced pressure drop. All S Series models also feature an expansion bellows to absorb different expansion rates between the shell and inner tubes. Individual units are available with surface areas from 1.3 to 6.8 m2, and units can be combined in a frame for larger applications. Surface finishes range from 0.4 to 0.8μ for pharmaceutical and hygienic industries and descaled for all industrial applications. HRS SP Series – Specifically targeted at pharmaceutical use, this multitube heat exchanger is ideal for WFI and purified water production, as well as many other uses. HRS SH Series – Multitube heat exchanger for hygienic uses such as cosmetics and personal care, food and beverage manufacture and potable water. HRS SI Series – A multitube heat exchanger for industrial applications such as chemicals, oil and environmental water applications. However, stringent the hygienic requirement of your process are, there is a new S Series heat exchanger to reduce the cross contamination risk during processing. The post Reducing cross contamination in pharma applications appeared first on HRS Heat Exchangers. This entry was posted in Copywriting and tagged HRS Heat Exchangers, pharma on 18 January 2019 by Richard. 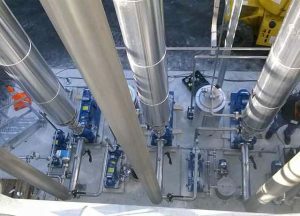 Pumps are an essential part of many food processing lines: not just for liquids, but also viscous materials such as spreads and dips, and materials containing solids such as fruit and vegetable mixes. Using the wrong pump can have expensive consequences in terms of both potential damage to products or equipment, or higher than expected energy costs. That’s why HRS offers a full range of hygienic positive-displacement pumps for a wide range of products and uses. All HRS reciprocating positive-displacement pumps feature a hygienic design incorporating a separator to ensure that there is no contact between the product and the hydraulic oil. Once the pump is in operation, no part which comes into contact with oil comes into contact with the product. Following the success of the standard BP Series in a range of applications worldwide, HRS Heat Exchangers have developed three other variants for use in a range of specific situations. The standard BP Series has an adjustable flow rate of between a minimum of 200 litres/hour and a maximum of 12,000 litres/hour, and features a high pressure drop of up to 30 bar. It is suitable for a wide range of high viscosity, shear sensitive and large particle-containing fluids. Clap valves allow pumping of whole fruits or vegetables, and an alternative piston pump with a pneumatic cylinder can be supplied for low pressure applications of less than 5 bar. The BPM Series is a mobile version of the standard BP Series pump. This is mounted on a mobile skid unit for easy movement, allowing it to be used across multiple production lines and locations, something which is increasingly popular with food manufacturers producing short runs of specialist products. With the BPM Series, companies can enjoy the benefits of a BP Series pump across multiple production lines without the need to invest in a dedicated pump for each line, resulting in considerable capital savings. The second addition to the range is the BPSC Series. This has been specifically designed for highly viscous products, such as hummus, and especially those which are produced and packed at low temperatures. When dealing with highly viscous materials, particularly at low temperatures, the product’s thickness can make it hard to prime the pump when starting production. The new BPSC uses a gravity-fed hopper together with a screw conveyor to overcome this and initially push product into the body of the pump. Once the cavity on the suction side has been filled, the pump is primed and will then operate as normal with a constant stream of product. The final addition to the HRS range of positive-displacement pumps is the BPH Series, a horizontal version of the BP pump with a vertical inlet. This has been specifically designed for products with larger sized pieces, such as fruit mixtures and coleslaw. To prevent damage to large particles, an automatic ball valve is used instead of the standard clap valve and there is also the option of a feed hopper. This entry was posted in Copywriting and tagged BP Series, HRS Heat Exchangers, pumps on 31 December 2018 by Richard. The management and treatment of manures and slurries from livestock production is becoming an increasing issue around the world. The potential of manure to cause environmental harm and contribute to climate change when not correctly stored, handled or applied is significant. However, manures and slurries also represent a valuable resource and can return valuable crop nutrients to farmland in a way which does not rely on energy-intensive industrial processing. In many countries there are environmental restrictions on the application of manures to land, meaning that farms must have sufficient storage capacity for manure which cannot be applied directly to land. As up to 90 per cent of pig and cattle slurry is water, reducing the water content is an effective way to reduce the required storage capacity. Furthermore, being able to store manure so that it can be applied when the nutrients it contains will be of maximum benefit is good agricultural practice and can help to maintain or improve crop yields, as well as reducing potential odours and gaseous emissions during application. 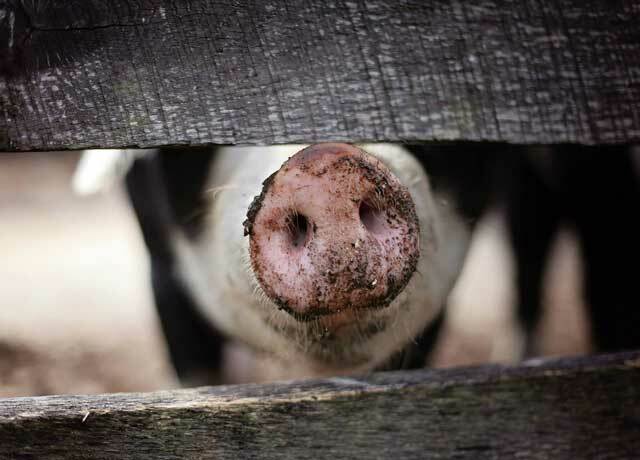 These challenges led to the creation of the EU-funded EfficientHeat project in 2011, which looked at an ‘Integrated and cost-effective solutions to reduce the volume of pig slurry; minimise pollutant emissions and process energy consumption’. The project, which was co-ordinated by HRS Sales and Product Development Director Arnold Kleijn, looked at how to improve the situation for pig producers in Spain, many of whom were reliant on off-site treatment plants to reduce the volume of slurry and manure produced. By the time the project was concluded in 2013, not only had it cut treatment costs by 40 per cent, but it had also speeded up the treatment process, reduced energy consumption by 25 per cent, cut slurry volumes by 60 per cent and created potential revenue streams for farmers in terms of nutrients and potential biogas. Following the success of the EfficientHeat project, HRS Heat Exchangers continued to develop the technology to improve its efficiency and make it suitable for practical use on farms. We utilised our Unicus Series scraped-surface heat exchanger technology to provide the necessary evaporation and used acid dosing to reduce volatile ammonia in the process. The first commercial HRS plant was commissioned in Spain and treats up to 12 tonnes and hour of pig manure from a number of nearby farms. The system has reduced volumes and therefore storage and treatment requirements, while the concentrated manure is returned to the farms for use as fertiliser. Since this first plant, we have been involved in four other plants which manage and concentrate digestate from anaerobic digestion plants using a very similar process. This entry was posted in Copywriting and tagged HRS Heat Exchangers, manure, R&D on 29 November 2018 by Richard. Industry 4.0; fourth industrial revolution; internet of things – Three terms referring to the shift in industry towards autonomous production systems using machines which are controlled and monitored by computer-based algorithms. While there can be a lot of hype, there is no doubt that the general direction of travel in manufacturing is for the use of more autonomous systems – presenting a fantastic opportunity for businesses to tackle key challenges, such as minimising and preventing waste. When processing various, often viscous, food products a certain amount adheres to the inside surfaces of machinery and pipework. Some product may also be left behind upon completion of each production run. A combination of good design and cleaning systems can be used to overcome the issue. The three main techniques – physical ‘pigging systems’, water-based flushing, and forcing clean air through the system – all remove residual product as part of cleaning-in-place (CIP) procedures, which may need to be carried out several times a day. While all of these recovery techniques have the ability to salvage residual product, a certain amount is still lost as waste. However, by using inline monitoring equipment linked to a system designed to allow product which meets the specified parameters to be reworked, the amount of valuable product recovered from equipment such as pasteurisers and sterilisers can be maximised. This concept is not new in automation. Every HRS pasteuriser or steriliser already has a temperature transmitter and a three-way valve installed after the holding tube. If for any reason the pasteurisation or sterilisation temperature (set point) is not maintained through the holding tube, the temperature transmitter sends a signal to the valve to return the product to the holding tank. This same principle is now being applied to the HRS Product Recovery System. Rather than just measuring temperature, any suitable physical or chemical property can be continually monitored, such as Brix, pH, viscosity or density. The choice of which parameter is used depends on the nature of the product and the sensors that are available. For example, on a line producing fruit juice, monitoring the concentration of the juice leaving the pasteuriser is monitored using a Brix meter allows any juice which falls below a set level to be diverted. By monitoring the product concentration from the beginning of the flushing cycle, it is possible to send juice with a Brix level of 12 or higher to the next phase of production (such as packing), and only discard material which falls below this set parameter. As well as increasing the amount of product which can be sold, reducing the amount of waste generated decreases disposal costs such as storage, transport and treatment. Alongside these financial benefits, the environmental footprint of the production line will also be improved, with more end product being obtained for the same effort – effectively lowering CO2e emissions per unit produced. Furthermore, cutting down the amount of product mixed in with the flushing or cleaning water means that the resulting waste stream is cleaner and will require less processing. As all HRS pasteurisers and sterilisers already include a three-way valve to allow for the diversion of out-of-specification product, the only real additional expense are the monitoring and control systems. With potential cost savings running into hundreds of thousands of pounds, such systems rapidly repay any additional capital expense. The post Reduce waste and future-proof production with automatic product recovery appeared first on HRS Heat Exchangers. This entry was posted in Copywriting and tagged automation, HRS Heat Exchangers, product recovery on 11 October 2018 by Richard. Thanks to tighter environmental regulations and greater public awareness, companies are increasingly looking to reduce or eliminate the waste that they produce. In recent years, Zero Liquid Discharge (ZLD) has become an important waste reduction technique, but its potential in dealing with hazardous waste streams has not been fully appreciated until now. One of the advantages of ZLD over other treatment techniques is its theoretical ability to separate unwanted materials from water, whether they are benign, hazardous or toxic. The resulting solid residue is often more stable, making it suitable for recycling or landfill. A well-designed ZLD system should minimise or even eliminate liquid waste streams, resulting in clean water for reuse or environmentally-friendly discharge, and a solid residue suitable for further processing (often to recover valuable components for use elsewhere) or for safe disposal. The composition of wastewater streams varies greatly; certain wastewater sources, such as power plants and boilers with wet gas scrubbing, often contain salts which may be hazardous, valuable, or both. Environmental regulation usually means that treatment is required to reduce or remove such toxic compounds before wastewater can be discharged. Other sources, such as wet flue gas desulfurization, may contain highly soluble calcium and aluminium salts, as well as heavy metals, which are not easily crystallised by evaporation. The effective design of any ZLD system, and the appropriate pre-treatment processes, is therefore dependent on the correct analysis of the water/waste stream, making it essential to have an accurate analysis of composition, flow rates, chemistry, etc. Without this, any designed solution will fail to deliver the required results, if it works at all. Vapour compression evaporation is commonly used in ZLD as evaporation can recover up to 95 per cent wastewater as distillate. Any remaining concentrate is further treated physically or chemically to produce solid residues (such as crystals) and water. By running the evaporators at lower pressures, the boiling point of the liquid being treated is reduced. This means that multi-effect evaporation can be made possible; that is, steam from a previous evaporation stage is used as thermal energy in the next stage which works at a lower boiling point. This way, multiple evaporation stages are combined, generating significant energy savings. For many components, crystal precipitation is favoured at lower temperatures, therefore lowering evaporation temperatures helps to increase the solids yield. HRS Heat Exchangers is in the final commissioning stage of a ZLD system for an industrial client in Europe. Heat exchangers play a crucial role in reducing the running costs of a ZLD system by utilising heat from process water and other existing sources, and also recapturing heat at the end of the process and reusing it to boost the energy efficiency of the overall ZLD system. Where there is a hazardous liquid waste stream to deal with, then the potential to utilise ZLD techniques as part of the overall treatment solution should definitely be investigated, and HRS staff would be happy to discuss the potential options with you. This entry was posted in Copywriting and tagged HRS Heat Exchangers, waste water, zero liquid discharge, ZLD on 2 October 2018 by Richard. At BioCycle REFOR18 stand 38, HRS Heat Exchangers will be demonstrating the crucial role that heat exchangers can play in improving the overall efficiency of biogas plants: from pre-heating feedstock to concentrating and pasteurising digestate. HRS Heat Exchangers provides a wide range of dedicated heat exchangers for the anaerobic digestion sector around the world, including feedstock and sludge heaters, multi-tank pasteuriser systems, evaporators, exhaust gas cooling, thermal hydrolysis, the HRS Digestate Concentration Systems (DCS) and the HRS Biogas Dehumidification System (BDS). Due to their high efficiency design which can include heat regeneration, not only do many HRS units need no additional energy input – instead utilising existing previously wasted heat from CHPs and other processes, but they maximise the amount of heat which can be re-used again. 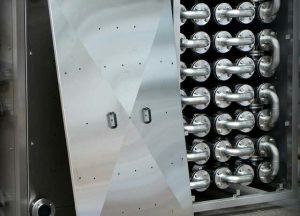 Biogas cooling: cooling and recapturing the heat from exhaust gases, for example using an HRS G Series heat exchanger, can increase the efficiency of combined heat and power (CHP) plants, with the recovered energy being used elsewhere in the plant. Feedstock and sludge heating: maintaining the ideal digester temperature (particularly in the case of thermophilic plants) is essential for full material conversion, while pre-heating the feedstock prior to putting it in the digester can reduce the amount of heat needed in the digester itself. For such applications the HRS DTI Series of heat exchangers is ideal for ensuring a high level of heat transfer while minimising blockages or fouling. Feedstock or digestate pasteurisation: not only are there legislative or quality drivers for pasteurisation, but operators of AD plants are increasingly seeing pasteurisation as a way of demonstrating the quality of their digestate product and increasing its value. HRS DPS (Digestate Pasteurisation Systems) are specifically designed to cope with difficult materials while maximising energy efficiency. Digestate concentration & evaporation: reducing the volume of digestate can not only improve its quality as an organic fertiliser, but it also reduces storage, transport, application and disposal costs. The HRS DCS (Digestate Concentration System) uses a multi-stage evaporation process to concentrate digestate. Thermal hydrolysis for enhance biogas production: HRS has developed a process for the continuous thermal hydrolysis of digester sludge. This treatment changes the cell structure of the compounds, breaking down lignin and hemi-cellulose chains to create free sugars which are easier for the bacteria to digest. Biogas Dehumidification System: The HRS BDS Series is an efficient solution to cool and dehumidify biogas for combustion. The system condenses up to 90% of the water contained in the gas, which is continuously separated before the lean biogas is ready for use. Learn more about the full range of AD systems from HRS Heat Exchangers on Stand 38 at BioCycle REFOR18 in October. 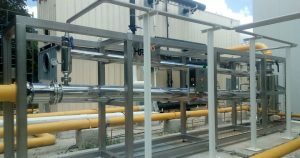 The post Heat Exchangers to improve AD plant efficiency appeared first on HRS Heat Exchangers. This entry was posted in Copywriting and tagged HRS Heat Exchangers on 26 September 2018 by Richard.